I think back to the Christmas three years ago, when Dad was all gloomy and he said times were hard, the economy was in trouble, and we'd have to make sacrifices. And then he woke us up on Christmas Eve and drove us to the airport, where we got on a flight to Hawaii. Middle school meets Mission Impossible in this hilarious spy series for fans of Chris Rylander, Stuart Gibbs, and Ally Carter about a girl whose life is turned upside down when she discovers her father is a superspy. Up until Bridget’s birthday the most exciting moment in her life was when Dale Tookey maybe, sort of, smiled at her one time. But that was before—before she found a mysterious present at her doorstep, before she was transported to a covert CIA agency called Section 23, and before she became Bridget Wilder: Spy-in-Training. Now Bridget’s busting boys out of detention, being chauffeured by a talking car, and infiltrating the popular girls’ clique to steal secret codes, all while undercover as a semi-awkward middle school girl. But will she be able to keep up with her new action-packed life? 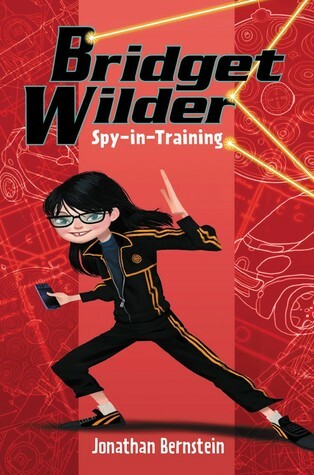 It is no secret—Bridget Wilder: Spy-in-Training is the start of an explosive new series packed with gadgets, humor, and best of all: girl power. Aah this sounds like a really fun series! I have to admit, I love Kim Possible so maybe this is one for me. The teaser already made me laugh so I guess that's a good beginning! Thanks for sharing :) I hope you have a great week! I don't read many YA or middle-grade books, but this sounds like one I'd enjoy. I'm curious about how she found out her father is a spy. What a fun surprise that would be! Thank you for sharing. Good surprise, but weird way to get at it. I love a good middle-grade read! Sounds like a fun read, enjoy!